Tresor Berlin is excited to present, in collaboration with Interdimensional Transmissions, a new party featuring great talents from Detroit and Berlin. This event is a new episode of the deep Techno Alliance between both cities. Tresor is forever thankful to Detroit for the groundbreaking musical impetus, which has continuously shaped Berlin's image over the last 26 years. 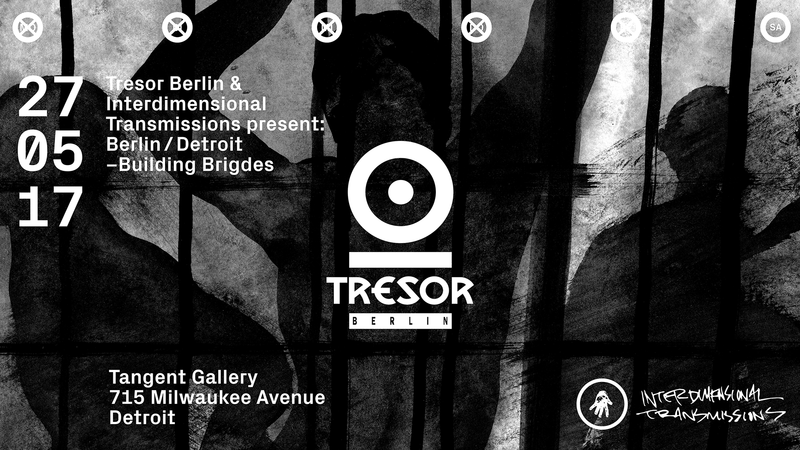 On Saturday May 27th, for its second consecutive appearance in Detroit, Tresor joins forces with Interdimensional Transmissions to curate an inspired program at Tangent Gallery. Riding the historical bridge between Detroit and Berlin is the exclusive world premiere of the collaboration between Motor City's Terrence Dixon and German legend Flowing, known for his work as part of the illustrious The Orb and 3MB formations. Surrounding this unique performance in the Gallery Room are sets from Detroit's one and only Claude Young, house maestro Marcellus Pittman and Clone mainstay Intergalactic Gary. 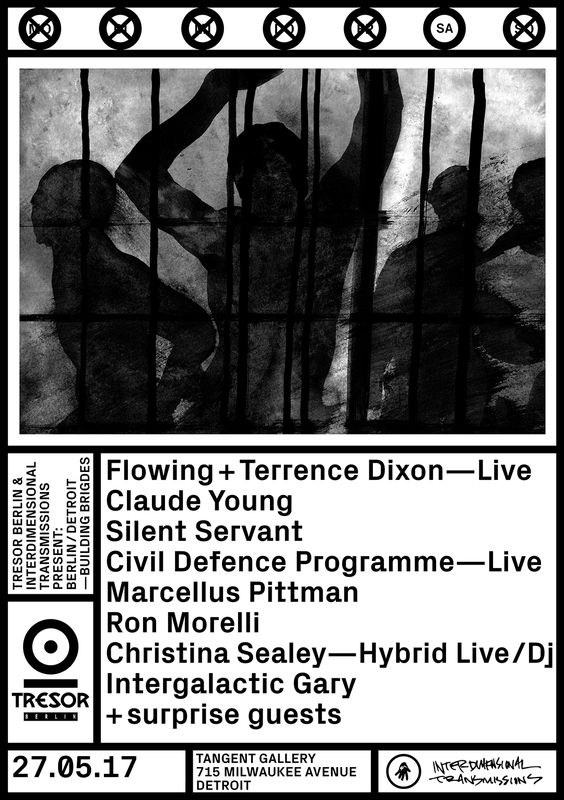 Over in the Ballroom, heavy machinery is set in motion, featuring a live performance by Berlin's Civil Defence Programme, as well as a hybrid live / dj show by Christina Sealey. These two shows are bookended by the heads of two of the most influential labels out there, Silent Servant (Jealous God) and Ron Morelli (L.I.E.S.). "Join us for a rare celebration where we return to the source, to what inspired us in the first place. Our home is in the underground." - from the inaugural leaky roof No Way Back in 2007. It was true then, and it is true now. What began as a party that extended beyond boundaries in 2007 has found a new home in the Tangent Gallery, and last year it blossomed into its own kind of festival, with the Tresor party on Saturday Night, No Way Back on Sunday, and The Bunker party on Monday. With the additional events not thrown by us, but that we do production for (Eden on Friday and Industry Brunch in the sunlight on Monday), the Tangent became its own special destination that weekend. To honor that this year, we are doing a specially priced weekend pass for all 313: Return to the Source events (Tresor, No Way Back, The Bunker), with a super deluxe weekend pass that includes a T Shirt from IT, a new Gunnar Haslam CD from The Bunker and a Drexciya “Harnessed The Storm” CD from Tresor, with other surprises included. This year is the 10th anniversary of No Way Back. To celebrate, there will be very special unannounced surprises at each event of 313: Return to the Source. Last year we had Mortiz von Oswald do a surprise set in the Outer Space room and Tin Man live for No Way Back; this year we can honestly say we may have surpassed that - for each show. To further celebrate the 10 years of No Way Back, we are launching the Acid Series, a series of records on IT inspired by the No Way Back parties. The Acid Series includes submissions from Tin Man & Ectomorph, Jasen Loveland, Justin Cudmore, BMG & Derek Plaslaiko, Jordan Zawideh, Dona, and Romans. They all arrive in a unique sleeve especially created for this series, inspired by the decorations of NWB. The first 2 volumes of the Acid Series will be available in the merch booth during all 313: Return to the Source events.